Steven (Chicagoland, United States) on 4 February 2013 in Cityscape & Urban and Portfolio. After 4.5 days of driving along the Pacific Coast Highway (tag: pch), and 2.5 days in San Francisco, our trip had to come to what seemed an abrupt end. This was one of the last photos taken after we flew out of Oakland. The bridge seen here is the Oakland Bay Bridge. San Francisco's skyline is seen in the distance draped in fog. Now I need to figure out what photos to post next as my days of photographing were limited due to work constraints and the "unwinterlike" weather we have been having for the last three months. Thank you for coming along for the ride since September and viewing the highlights. Photo captured August 21, 2012. Terrific high point of view and a high point to end the series with Steve, looks terrific in black and white. Fantastic point of view and b&w ! Most enjoyable series, Steven. Love this epic high view - superb in b&w. Fabulous point of view ! Amazing cityscape ! Das sieht in B&W auch sehr gut aus. Das war eine gute Serie. Exceptionally good black and white aerial, Steven ! Une magnifique vue d'ensemble ! A wonderful window that opens through the clouds. Wonderful! Stunning point of view. The B&W looks like a magazine shot! Excellent. A fine shot and excellent series. 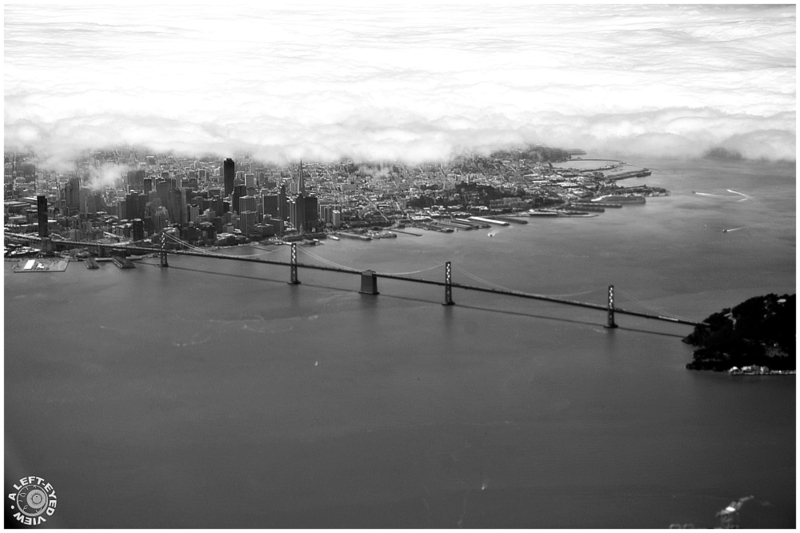 Love the bridge and the fog in B&W. Very nice b/w shot of the city you are leaving. Beautiful view. You ended on a high note, Steven, and thank you for sharing your wonderful images of the trip! Beautiful aerial view! This was a great series. I really enjoyed it! That is brilliant! It's a shame it has to come to an end :( ... I can see this being published somewhere. The view is vast and excellent! Beautiful to see this final image, such a beautiful series, that will not be forgotten !